61-393 XV370 Sikorsky SH-3 D to G-ATYU 23/08/1966, withdrawn from use August 1989. 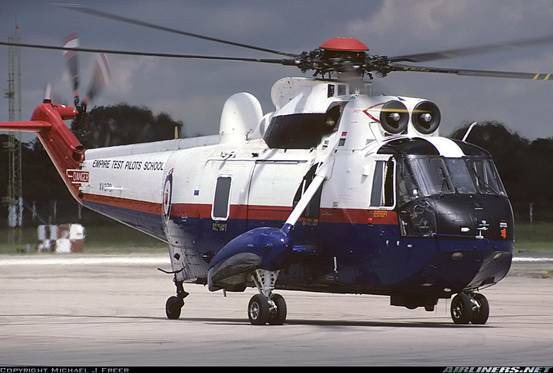 Became A2771 08/01/1990 at Lee-on-Solent, then to WHL Yeovil for G/I 31/01/1990, to A2682, to AESS Gosport, Hampshire 1996 for G/I Used as the lead development aircraft in the Sea King programme, engaged on performance handling and AFCS work. Taken on the strength of the Empire Test Pilots School at Boscombe Down. 61-396 XV373 Sea King HAS1 d/d 1971, used for avionic and systems development, passed to A&AEE Boscombe Down as a navigation and radio trials vehicle. Withdrawn from use in 1986, to Pendine Sands, perished. WA630 XV642 Sea King HAS2 f/f 07/05/1969, GIA AESS Gosport, Hampshire The first production Sea King, used for development trials and icing tests in Canada, subsequently used as the conversion aircraft for the HAS 2 and later for the development of the composite main rotor blades. 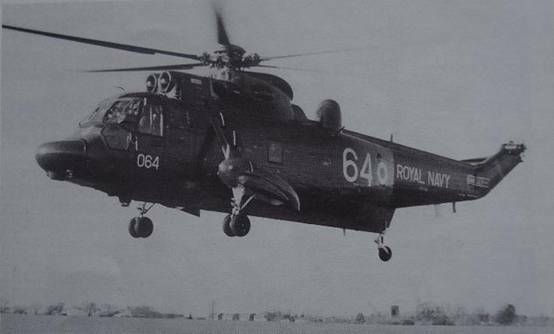 WA632 XV644 Sea King HAS1 f/f 07/08/1969, d/d 19/08/1969, w/o 19/11/1974, A2664, scrapped Predannack. Ditched 20 miles off Portland but recovered and declared Cat 5. 700S, 737. WA634 XV646 Sea King HAS1 f/f 30/07/1969, d/d 19/08/1969, w/o 25/10/1977 Lost, ditched of HMS Hermes in Western Approaches, loss of yaw control. 700S, 814. WA637 XV649 Sea King ASaC7 f/f 21/09/1969, d/d 06/10/1969 700S, 706, 849. WA639 XV651 Sea King HU5 f/f 17/10/1969, d/d 07/11/1969 Retained by Westland for Hot weather trial at Edwards AFB. Converted To carry Ferranti SeaSpray radar as a trials vehicle at RRE Pershore, later used by RSRE at Bedford for radar trials. After service with 771 the aircraft arrived at Boscombe Down in January 2006 in order to take over the trials duties of XZ575 which was the trials platform for the Carson Blades. The aircraft remains at Boscombe Down fulfilling trials activities as required. 706, 814, 771, D Squadron. WA838 XZ570 Sea King HAS5 f/f 18/06/1976, d/d 19/07/1976, stored, Gosport, Hampshire. The first HAS 2 it was used as the prototype vehicle for the development programme. It was retained at Westland as the trials installation airframe continuing to assess Sea King HAS 5 vehicle aspects and composite main rotor blades. The aircraft was extensively modifies to carry the Ferranti ‘Blue Kestrel’ radar and EH101 mission system known within the EH101 programme as ‘The Hack Sea King’. One of its last tasks was the assessment of the Sea King ASaC 7 mission systems. WA927 ZB506 Sea King Mk.4X f/f 19/11/1982, d/d 23/12/1982 Delivered to RAE Bedford then to A&AEE Boscombe Down. WA960 ZF115 Sea King HC4 f/f 03/06/1986, d/d 03/07/1986, crashed 30/11/2001 A&AEE as navigation and radio trials vehicle. Currently at 848 NAS in 40th Anniversary colour scheme. 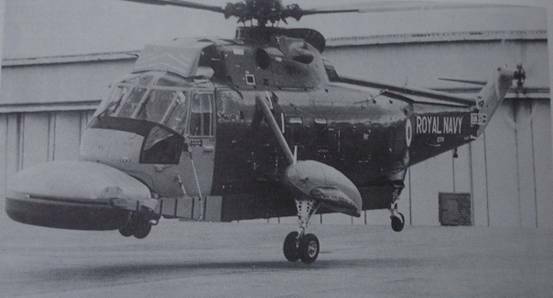 WA996 ZG829 Sea King Mk.4X f/f 10/04/1989, w/o 20/10/1992 Empire Test Pilots School, crashed during tethered hovering serial, aircraft lifted for fuel whilst still attached to cable.